Lol spins his favorite Cure tracks as well as tracks by artists that influenced The Cure and their unique sound. This is an event not to be missed! Lol's Dj set. 10:15 - ?? The Village Voice is running a contest to win a pair of tickets to the MSG show on June 20th. Soundcheck: A Letter to Elise, Friday I'm in Love, Last Dance, This Twilight Garden, Doing the Unstuck, Trust. 4th encore: The Walk, Exploding Boy, In Between Days, Doing the Unstuck, Friday I'm in Love, Just Like Heaven, Boys Don't Cry. Thanks to Paul K. and @AlbertRuizJ for the setlist reports, to @notquitefaust & @TheCureMexico for all the scopes, to @namepa100169 & @MarcSTheCooler for photos, and everyone else who helped out tonight. Can't thank you all enough!. The Twilight Sad 7:30 - 8:10, The Cure 8:30 - 11:30? 2nd encore: The Lovecats, Close to Me, Let's Go to Bed, Freakshow, Why Can't I Be You? Thanks to Paul K. for the live setlist reports. Including rare live performances of "Screw", "The Exploding Boy", "This Twilight Garden", and "The Perfect Girl"
Last week, The Cure launched their latest US tour with a jaw-stopping set in New Orleans. The show spanned 28 songs and four encores, including the debut of two new tracks in “Step Into the Light” and “It Can Never Be the Same”. It also featured a handful of rarities, some of which hadn’t been played live in some three decades. The band has played five more shows since then, and the setlist have gotten more and more nuts. During their second shows in New Orleans, Robert Smith & co. dusted off “Screw”, from 1985’s The Head on the Door, for its first live performance in 30 years. The Disintegration tracks “Closedown” and “Last Dance” also appeared on the band’s setlist for the first time in over a decade. What’s more, “This Twilight Garden”, the b-side to the 1992 single “High”, received its live debut. In Austin, The Cure performed their 1985 b-side “The Exploding Boy” for the first time in 30 years, and also waxed nostalgic with rare live renditions of “Bloodflowers” and “Out of This World”. Meanwhile, in Houston, they dusted off “The Last Day of Summer” after 14 years. Perhaps most impressive was the set given in El Paso. Amid a 35-song, five-encore set (! ), the band rolled out “The Perfect Girl” for the first time in 26 years, as well as “(I Don’t Know What’s Going) On” for the first time since 2004. Additionally, Smith led the English outfit to unearth “Watching Me Fall” for the first time since 2007 and “The Snakepit” for the first time in 16 years. Fan-caught footage of “Last Dance” has surfaced and can be seen above. Below, watch them play “Screw”, “Closedown”, “Last Dance”, This Twilight Garden”, “The Perfect Girl”, and “The Snakepit” via YouTube user edgeofthewind. The full setlists for each show can also be found below. "There's a tired bit of conventional wisdom about how The Cure’s music resonates most strongly with teenagers. It’s not totally wrong, necessarily—a fair chunk of The Cure’s catalog is mired and darkness, angst and depression. They’re as much a brand as a band, the stadium-filling spokesband for goth, their logo scrawled onto countless Trapper Keepers, their lyrics written on the inside cover of every yearbook. As Bart Simpson once astutely observed, “making teenagers miserable is like shooting fish in a barrel,” and the band’s frontman and songwriter Robert Smith was happy to oblige, and in lipstick, eyeliner and Aquanetted hair no less. I had my share of teenage experiences with The Cure. I impulse-bought a CD copy of Kiss Me Kiss Me Kiss Me in the summer of 1999, after hearing “Why Can’t I Be You?” on a 91X Fourth of July countdown, and had it on regular rotation between Pavement and Neutral Milk Hotel. Not long after that, a girl made me a mixtape of songs from their first three albums, which in hindsight sounds like it could have been a deleted scene from Pretty In Pink. I was introduced to The Cure much earlier than that, though, hearing “Close to Me” on my brother’s stereo, and my sister had a copy of Three Imaginary Boys on vinyl—the one where all the song titles are depicted as pictograms rather than with words. (The easiest one to decipher? “Meathook.”) "
Read the rest at their website. Bloodflowers - El Paso, Don Haskins Center 17-May-2016 from itsaperfectday on Vimeo. 39 - El Paso, Don Haskins Center 17-May-2016 from itsaperfectday on Vimeo. Other Voices - El Paso, Don Haskins Center 17-May-2016 from itsaperfectday on Vimeo. The Drowning Man - El Paso, Don Haskins Center 17-May-2016 from itsaperfectday on Vimeo. The Perfect Girl - El Paso, Don Haskins Center 17-May-2016 from itsaperfectday on Vimeo. "For people asking about the vintage Fender VI Bass guitar that I use with The Cure -- I wrote this description in 2012 when I started playing it. It still holds true. Currently (2016), my amp combo for the Bass VI is a Hi-Watt amp with a Mesa Boogie cabinet. Actually, all three of my speaker cabinets on stage are Mesa Boogie -- a change made after the tour program was printed. The program is accurate for all else. On the guitar front, if there is a single instrument that makes The Cure sound like The Cure, in my opinion it's the Fender VI (six-string bass), with Robert Smith’s distinctive playing and use of it, not as a bass—totally unnecessary when you have an incredible bass player like Simon Gallup—but as a unique guitar voice. Since I do not own a Fender VI (though I did, for a time, own a Jerry Jones Danelectro-style six-string bass), Robert offered me one of his. Thus the instrument I am playing on those three songs live is Robert Smith’s black 1962 Fender VI, which has a reddish tortoise-shell pick guard. I’m sure it has a lot of stories to tell. It has the three original Fender Jaguar-style single-coil pickups, plus three on/off pickup selector switches (one for each), as was standard for that era Fender VI. The Snakepit - El Paso, Don Haskins Center 17-May-2016 from itsaperfectday on Vimeo. Bumping this to the top due to lots of people asking about the shirts. Shirts are $25, bags & hats are $15, Tour Book is $10, Postcards are $5. 2nd encore: If Only Tonight We Could Sleep, Catch, The Perfect Girl, Why Can't I Be You? Thanks to @christinefalls for the set reports and to @notquitefaust & @TheCureMexico for the Periscope links. Since we have an off night on the tour, and I saw a few requests for some Twilight Sad videos in the comments, here you go! I Love this band! Help recording Twilight Sad shows? Update: And if anyone has video or audio of the Houston show, or just 'I Could Give You All That You Don't Want' with the intro dedication, please let me know. Thanks! Can some of you help Rob with this? 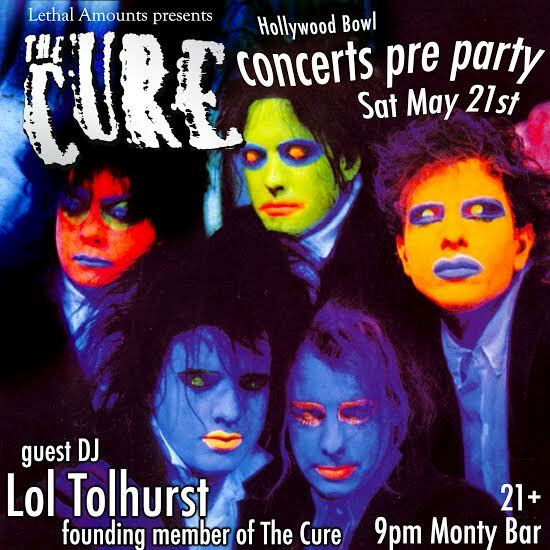 "I presume a good number of The Cure shows in the US and Canada will be taped. I wonder whether you have any taper contacts who'd be good enough to also record the Twilight Sad support sets. A mountain of TS recordings for trade here, as well as a heap of other stuff. Private trades would be great, likewise anything appearing on Dime/tradersden etc." If you can help Rob out, contact him here - robstrong (at) blueyonder (dot) co (dot) uk. And I've checked with the band, and they are fine with the shows being recorded and traded for free. The Scottish band The Twilight Sad hopped on the indie scene to critical acclaim in 2007 with its debut album, “Fourteen Autumns & Fifteen Winters.” The band, which combines noisy guitar with folk and lead singer James Graham’s heavy accent released two more albums, but according to Graham, felt like it had hit a wall, both creatively and in terms of popularity, following the release of its third album “No One Can Ever Know” in 2012. The band returned, reinvigorated in 2014 with the release of its fourth album, “Nobody Wants to Be Here and Nobody Wants to Leave.” Graham said the band approached the album as if it could have been its last. But the critical and fan acclaim that the album has garnered all but assures this won’t be the case. The band has been riding high since the album’s release and now finds itself on its biggest North American tour, opening for The Cure. The tour stops in El Paso at the Don Haskins Center on Tuesday. Graham took some time for a phone Q&A with The Beat from his home in Glasgow prior to the tour kicking off. The Beat: So you’re about to go on tour with The Cure. What have you been doing to get ready? Graham: It’s been a weird couple of days. I’ve been working with Stuart (Braithwaite) from Mogwai and Rachel (Goswell) from Slowdive on a project they are working on. I’m singing one song with them, it was really easy going. I’m just back (in Glasgow) for a couple of days before we take off to your country. The Beat: Is it a surreal feeling to know you’re about to be on tour with one of your biggest influences? Is this your biggest tour of the U.S? Graham: I feel privileged to be asked to be on it. I’m not going to lie, it’s pretty much a dream tour. A dream come true. We are used to playing 300-capacity venues. We toured with Mogwai once and it was a bit bigger but this is something I never thought was ever possible or would ever happen. Six weeks playing in front of thousands of people. The Cure are our favorite band so I’m waiting to wake up from the dream or find out somebody’s playing a mean trick on me. The Beat: You’ve been catfished! How did the tour happen? Graham: (Laughs) Yes! We found out Robert (Smith) was a fan of the band on our second record. Mogwai emailed him some songs and Robert said he was already a fan. I ran around my house screaming the night I heard that. Then every time a record came out, we sent it to him. Last year we asked him if he’d be up to cover one of our songs, for a b-side. That was mind-blowing. Then Robert emailed Andy, our guitarist, asking if we would like to go on tour. He’s been absolutely amazing. It’s amazing to see someone that can (care) and really want to help us out. Last Dance - Dallas, American Airlines Center 15-May-2016 from itsaperfectday on Vimeo. Charlotte Sometimes - Dallas, American Airlines Center 15-May-2016 from itsaperfectday on Vimeo. Closedown - Dallas, American Airlines Center 15-May-2016 from itsaperfectday on Vimeo. Plainsong - Dallas, American Airlines Center 15-May-2016 from itsaperfectday on Vimeo. Trust - Dallas, American Airlines Center 15-May-2016 from itsaperfectday on Vimeo. Us or Them - Dallas, American Airlines Center 15-May-2016 from itsaperfectday on Vimeo. Burn - Houston, Toyota Center 14-May-2016 from itsaperfectday on Vimeo. It Can Never Be the Same - Houston, Toyota Center 14-May-2016 from itsaperfectday on Vimeo. M - Houston, Toyota Center 14-May-2016 from itsaperfectday on Vimeo. 2nd encore: Hot Hot Hot!! !, Close to Me, Let's Go to Bed, Why Can't I Be You? Note: 'It Can Never Be The Same' was on the stage setlist, listed after 'Burn', but was cut. Presumably due to time constraints of the curfew? Also, first night of the tour to not see any new surprise songs added, and first night of the tour that 'It Can Never Be The Same' wasn't played. The Last Day of Summer - Houston, Toyota Center 14-May-2016 from itsaperfectday on Vimeo. A Strange Day - Houston, Toyota Center 14-May-2016 from itsaperfectday on Vimeo.